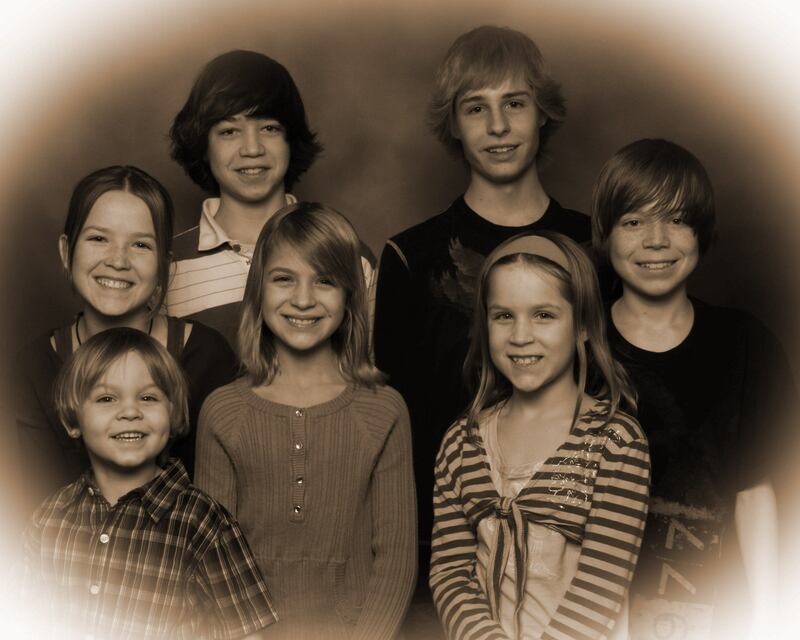 I’m overdue for an another athlete-mom interview, so check out this interview with an amazing mom of seven kids, yes seven!! 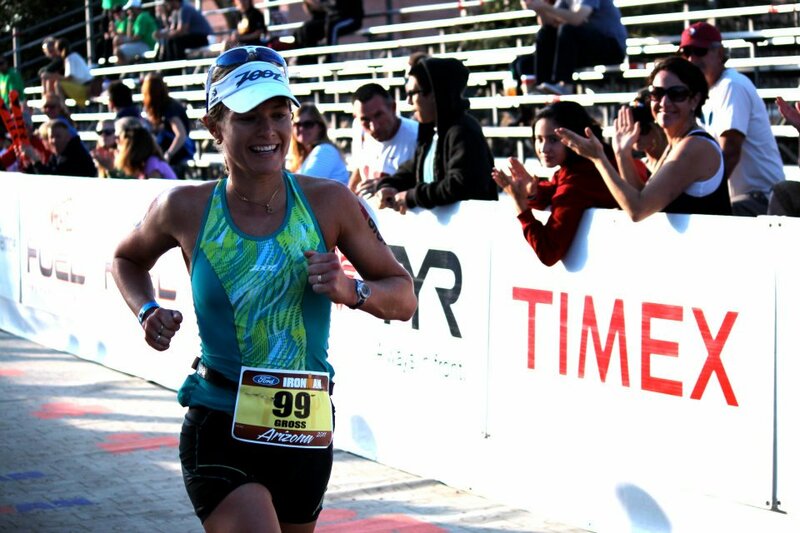 If you think its tough to get and stay fit with just one or two children, read on to see how Lesley has done it with in her words, “seven wonderful children ranging in age from 7 to 21.” Read on to hear about her life as a stay at home mom, to a single and super fit working mom, now in training for her second Ironman! 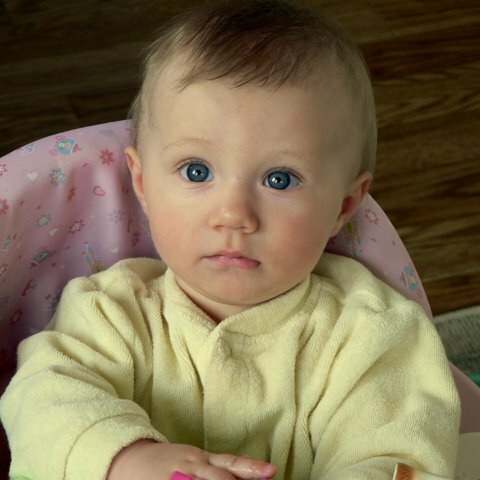 What are the ages and names of your children? My first three are boys. Andrew 21, Craig 19, Benjamin 17. Then came the three girls. Shayanne 15, and twins Emily and Katie 13. Then the youngest little guy Eli who is 7. How active were you prior to having your children? The amount of physical activity that I did before having children was none! I was busy studying for my Social Work Degree. 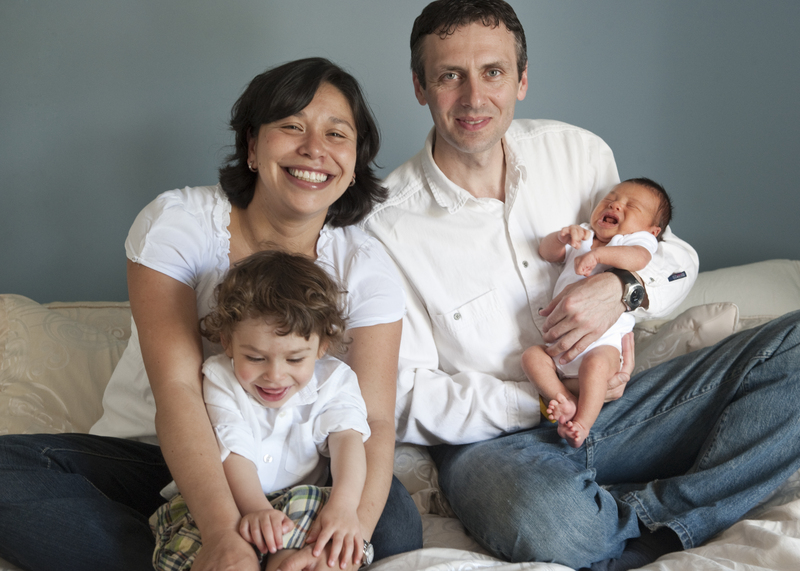 Shortly after graduating University I had my first baby, and they tumbled forth in rapid succession! As a stay at home mom, my workouts were composed of running up and down stairs to change diapers, weight lifting was the laundry (which I liken to the eighth wonder of the world) and carrying car seats everywhere, running up and down the sidelines at the kid’s soccer games cheering them on and carrying them into the house when they were exhausted after their big game! I was fully immersed in raising my children. When the twins were born I had six kids aged seven and under. I also had a marriage where I was alone 80% of the year as my now “Wasband” travelled overseas most of the time. As time passed I was becoming increasingly lonely and frustrated as I knew I was losing myself, and wondered if I would ever find myself again. How did you find the time to find physical activity (and yourself :)) again? My fitness journey began one day when I happened upon a kickboxing studio where my oldest son was competing in soccer. I gave it a try one night, and from that day on I went everyday for 6 years (one of those years I was pregnant with my last child and actually trained intensely right up until the day I had him….EASY BIRTH/ EASY RECOVERY!!!) until I earned my black belt in Muay Thai and Kickboxing. I entered the ring and won a Canadian Championship bout in Vancouver. I started training for my bouts at the Talisman Centre where I began another chapter, teaching the Get Ripped Program (Lesley is currently in 9 of the Get Ripped DVDs). The creator of the program had seen me at Talisman and begged me to teach it. I was incredibly reluctant to do so as I still hadn’t found myself and had NO confidence at all. Upon her insistence I started to teach the program. Right around this time my “wasband” came home from his travels one day and decided that our marriage was over. At that moment my days as a stay at home Mom were over. I hadn’t worked for 14 years. I was now single-handedly raising 7 children 99% of the year! Teaching fitness became my profession and my passion. What I didn’t know at that time was that it was something I was becoming really good at and my children and a wonderful group of highly supportive women who were participating in my classes were being so incredibly supportive that I started to find out where and who I was! I somehow gathered up a huge following who continue to encourage and support me every day. I have found that having that positive support system to be integral to anyone who is trying to juggle family and a fitness goal. 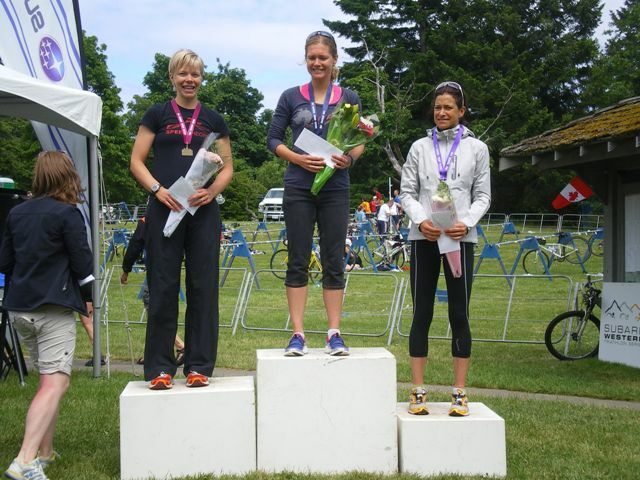 Three years ago I was approached by a triathlon coach who expressed that I would be a great triathlete and would I consider trying out the sport. 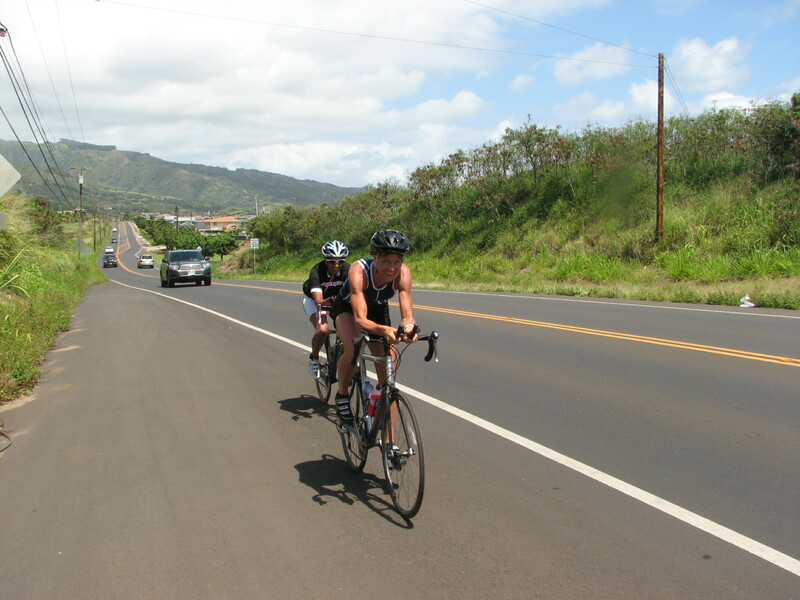 I have always had the philosophy that people should try things once….Well here I am three years later training for my second Ironman! How do you balance your training with work and family? My training schedule for this incredible undertaking is somewhat hectic and sometimes exhausting. I choose to swim early in the morning way before my kids are up, and run while they are in school. My long bike rides happen while they are with their dad on the weekends, and thankfully when they are not with him they are so supportive that they almost push me out the door!! What do your kids think of their active mom? 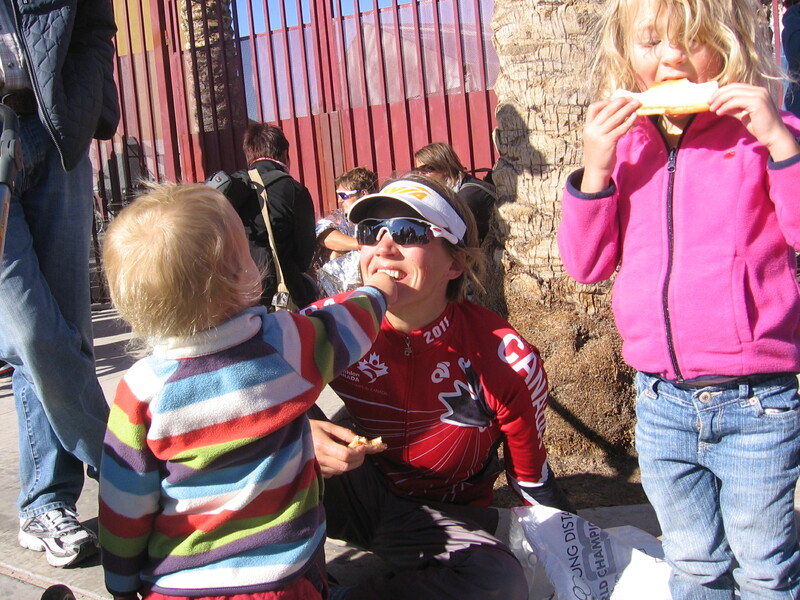 My children have shown incredible support of my goal to compete in Ironman and all of the races I compete in. They understand it’s importance to me, and have joined me in my sport by competing in a few races of their own. I know they are proud and inspired by my tenacity, and my overwhelming desire to constantly get back up and keep going when times are rough. 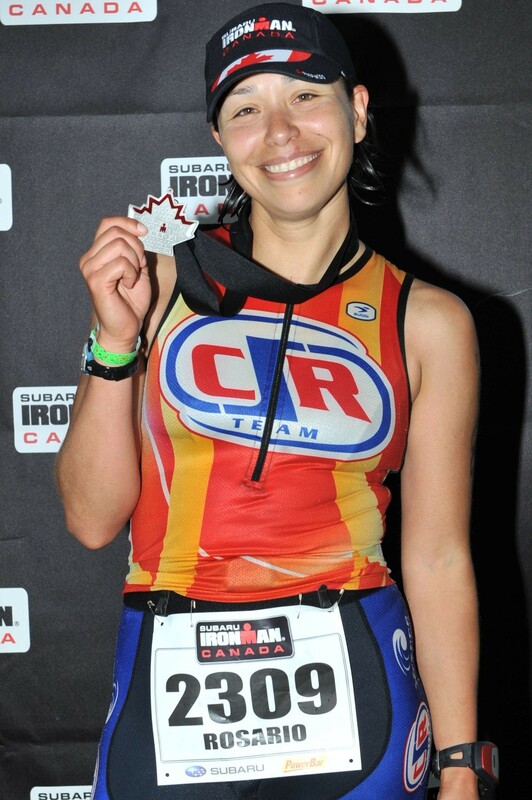 I am blessed that they continue to allow me to fulfill my goal this year of improving my time at Ironman Canada. It is also my goal to be the very best single working parent that I can possibly be, however it is a very fine balance of hard training, work, family and a lot of encouragement and determination. 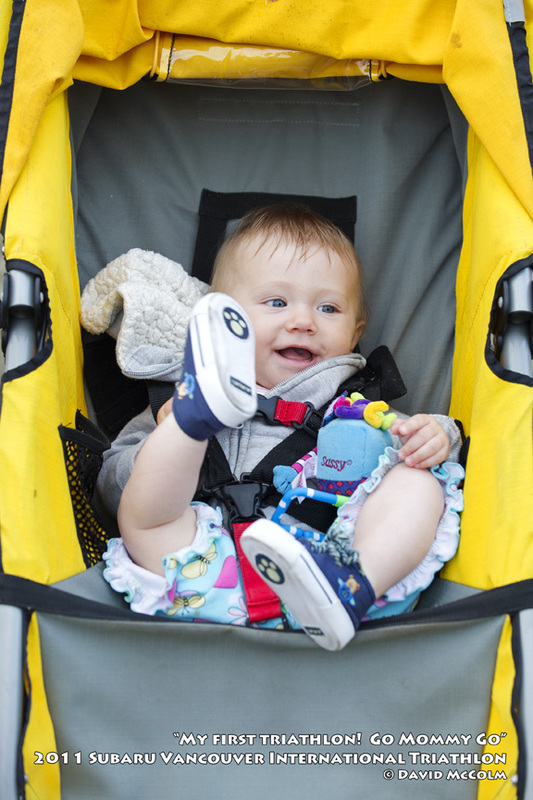 Any advice you would give to other moms while trying to stay active while raising a family? 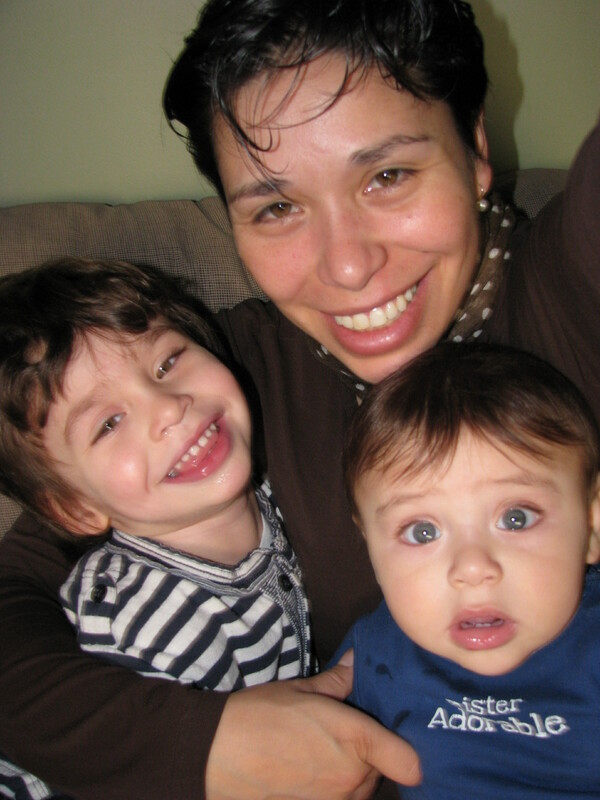 As a mom I think it is so important to keep yourself close to the top of the totem pole in life. Remember in addition to being a mom, a wife, an employee or employer, you are also a woman who should forever be challenging herself to personal goals and personal time to achieve those goals. My experience has allowed my children to understand the importance of goal setting, the long-term benefits of fitness and proper nutrition, the ability to create and maintain balance in their lives and the life long lesson that when life hands you a challenge, you are the only factor that can hold you back. There is ALWAYS a way, and there is no such phrase as “I can’t”. I’m proof of that. As a side note, I now have a wonderful man in my life now who is also training for Ironman and supports me every day and allows me to do the same for him. To every challenge in life there is a light at the end of the tunnel. Think positive and surround yourself with positive people and you will accomplish everything! What kind of work keeps you busy these days? I am now what I call a Life Coach. I teach mostly women how to pick up the broken pieces and make themselves whole again through proper fitness and nutrition. My goal is to teach them to become whole for the rest of their lives, not just for the moment. I create individual fitness programs on line for those women who have children and just can’t get away from home, or if they can get away just for a while a program that will suit their needs at a fitness facility. I also teach Fitness classes at Talisman Centre and Heaven’s Fitness, and am a personal trainer who will come to people’s homes to train them there or if weather permitting, in the great outdoors. To all you ladies who are striving to reach a goal and have children in your lives… I am well-known for this saying….YOU CAN DO THIS!!! I’d heard about this half ironman distance race up near Edmonton that everyone raves about as long as I’ve been in Calgary. 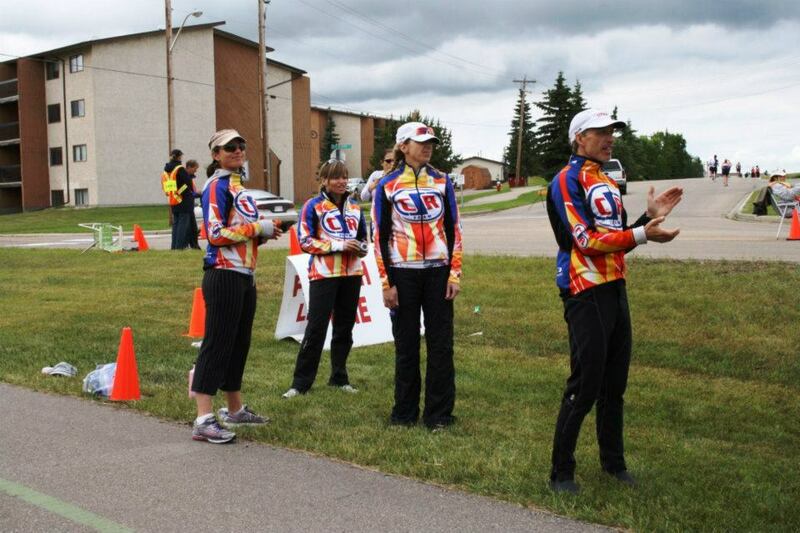 So I was excited to finally take the opportunity to participate in the Great White North Triathlon in the small, cute town of Stony Plain this past Sunday. 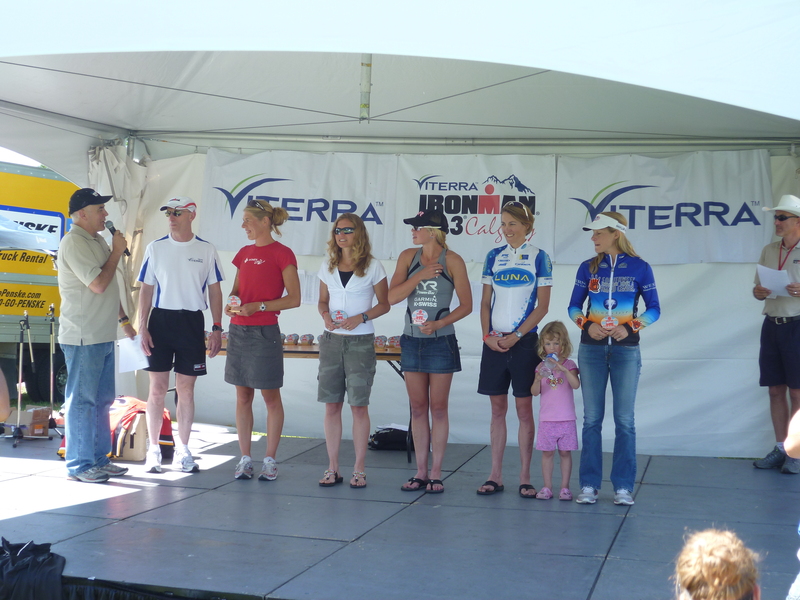 This race has had some super strong women winners over the past years with the long-standing course record set by the famous Heather Fuhr back in 1993. With great prize money (2500$ for the win) and 250$ primes for the fastest swim, bike, and run splits, I knew it would take a really solid race to come out on top against some motivated and tough competition. On the morning of Canada’s 145th birthday, I lined up to celebrate Canada Day with roughly 1000 other participants on the beach of Hubble lake for an 8:00am 2km swim. In the biggest mass start race I’ve ever been in for a triathlon, I managed to stay out of the chaos and got around the first two buoys okay for the first of a two-lap swim. Considering it was a grey, cool, and drizzly morning, once in the water I felt amazingly warm in my wetsuit. I exited the water 52nd overall, and with at least 8-10 women in front ot me. After adding arm warmers and a vest in transition to the bike, I was sure glad I had the added clothes, as the rain came down hard on the bike and hardly let up the entire time! I left transition with last year’s winner, Annett Kamenz, and knowing she is a super strong cyclist, my plan was to just keep with her as long as possible. WIth so many people I eventually lost sight of her but just worked on keeping a strong pace. Fortunately I was rarely feeling cold despite the rain and could focus on just riding strong. The bike course had few hills and is known to be super fast but with the heavy rain and wind the times were likely a little slower overall. Near to the 50 km turn around mark, I caught up to Emanuela Bandol, who let me know there were a few women 5-6 minutes up ahead, shoot I had some work to do to stay in contention! 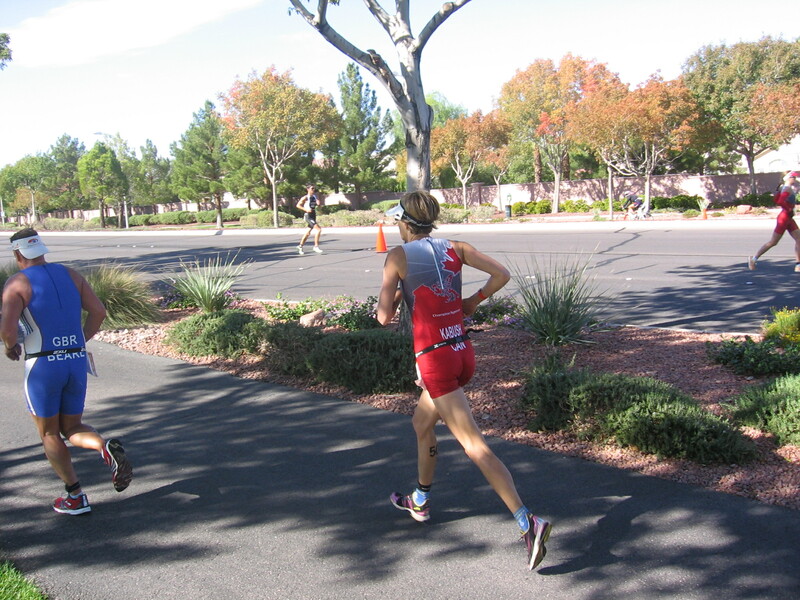 I saw Annett just ahead shortly afterwards, caught back up to her and we ended up going into T2 together 30km later. With plenty of fluid and Clif shot gels in me, I was feeling reasonably good for riding 90km in the rare time trial position for me. I hit the run in 4th place and tried to find a good rhythm as my wet, numb feet and shoes sloshed on the pavement. A few kilometres into the run I saw my Coach Cal and the rest of the Critical Speed Racing team cheering crew. They told me I was 1:30 back from 3rd place. Turns out I was about 7 minutes back from the first two places but they didn’t want to tell me that yet. With three out and back turn around’s on the run I was able to check my own back splits and soon learned at the first turnaround that I was 6 minutes back from first. 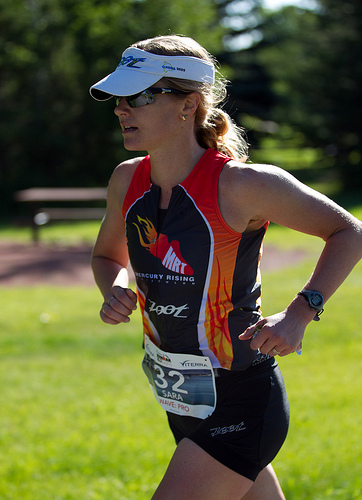 The leaders Tanya Salomon and Kelly-Lynn Marcotte looked strong to me so I would just go hard and see what I could do! No pace checking, I would just go by feel. I moved into 3rd place before the 5km mark. By the halfway point, I realized I had cut the lead down to 3 minutes, I just needed to keep up the same pace! Next time I saw Cal, I had moved into 2nd and was 1 minute back of first with about 4km left to go! 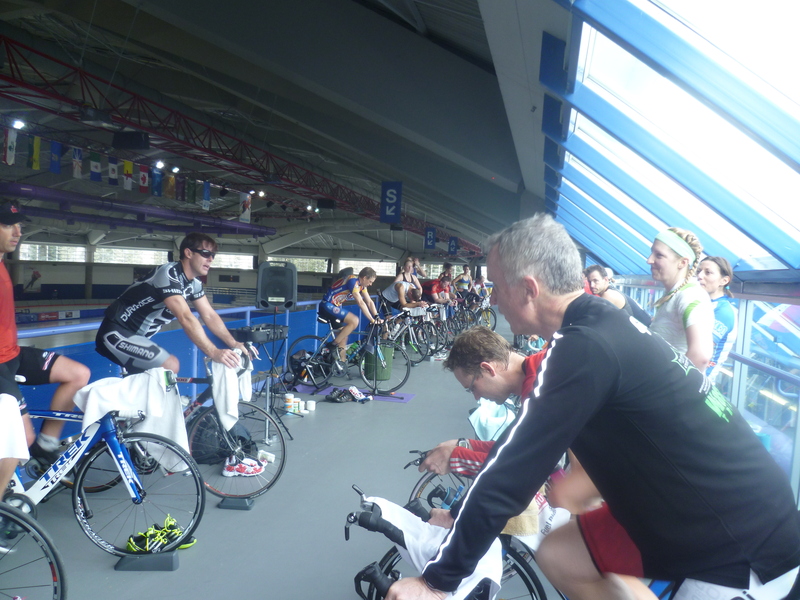 Coach Cal and the Critical Speed Racing Cheering Crew! Thanks to Kelly Frank for the photos! After the last out and back turnaround Tanya was in sight. With 2km to go, I caught up and passed. I was ecstatic to take the lead but at the same time I had to keep pressing because she was fighting hard behind me. The last bit was slightly uphill and my legs were killing me, but I was finally able to celebrate around the last corner to the finish line, with the amazing announcer Steve King bringing us all across the line! To my amazement I had run a 1:24:13, and the 6th fastest run of the day for the entire race. A great race, I would highly recommend it! I’d like to give it another go on a warm sunny day! Congrats to all my friends, and training partners out there who completed the race!It is so much fun to do an event when knowing so many people! Full results can be found here. 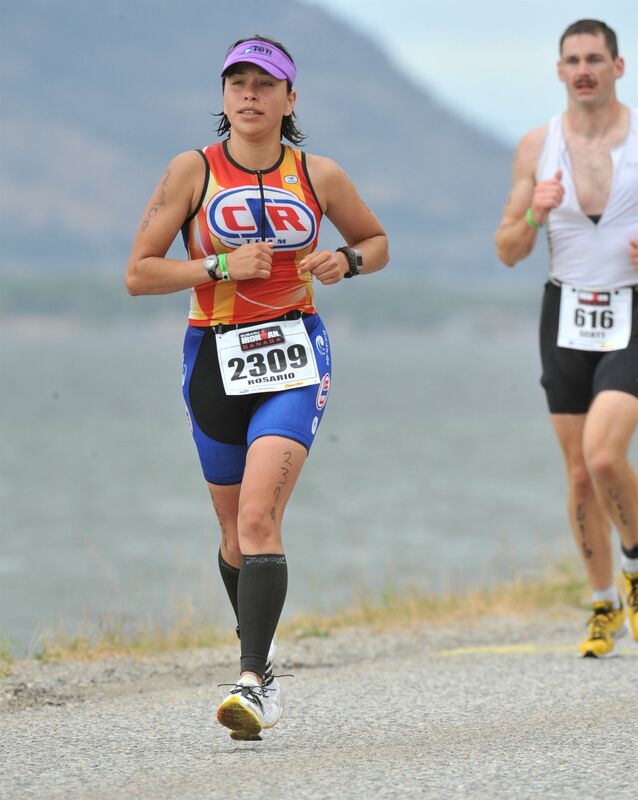 I finished my triathlon season where I began it 7 months ago in April at the Xterra West Championship. 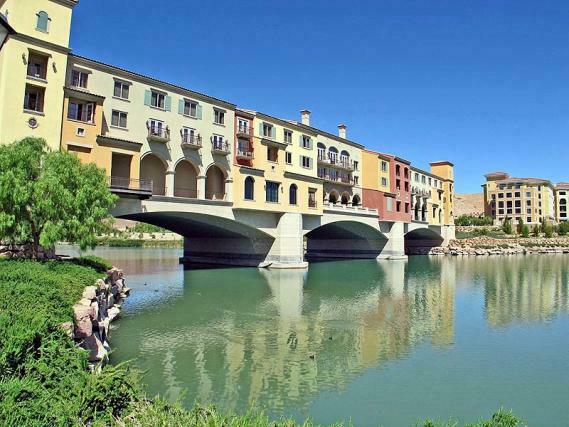 With some good recovery and a minimal amount of training since Xterra Worlds two weeks ago I arrived at Lake Las Vegas feeling good, and miraculously having avoided the terrible colds that my kids had all week. Team Canada had organized a group swim in the lake on Thursday, and although the water was cool to get in, it felt fine once we got swimming. However, on Friday, the afternoon before the race the temperature dropped and the skies opened up with heavy rain for several hours. 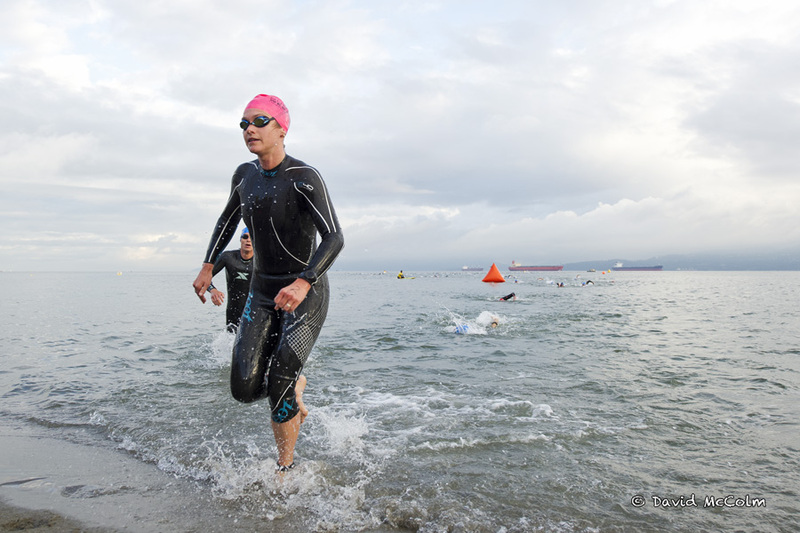 The next morning I arrived in the twilight at transition about 45 minutes before the scheduled 7:00am race start time to learn that the 4km swim had been cancelled!! The reason was due to the combination of cool air temperature and cool water being deemed unsafe to race. While this was definitely in my favour against my strong competitors in the elite category, most of them top swimmers, I have to admit I still feel a little jipped that I did not get to experience a 4km swim as part of a race. That said I’m definitely not complaining that we were saved from starting the bike wet and possibly hypothermic! My body also feels beat up enough after racing 120km on the bike followed by a 30km run, definitely my biggest race/endurance challenge to date! I hope be able to walk again normally in a few more days, ha! The swim start that was not to be! With the swim cancelled (the lake and arches we would have started under pictured above), it was a time trial start with racers starting at 5 second intervals. With no swim, I was able to dress perfectly for the weather, and at least it was sunny with the eventual high around 16 degrees. I felt good on the bike right from the start. 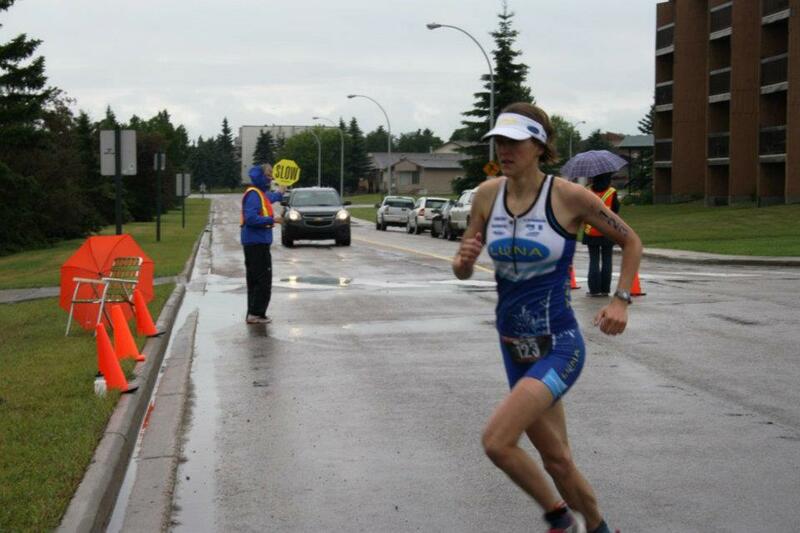 I had not ridden my Orbea Ordu time trial bike since the end of July at the Calgary 70.3 so I was glad the position felt so comfortable as soon as I got on it again just the day before the race. 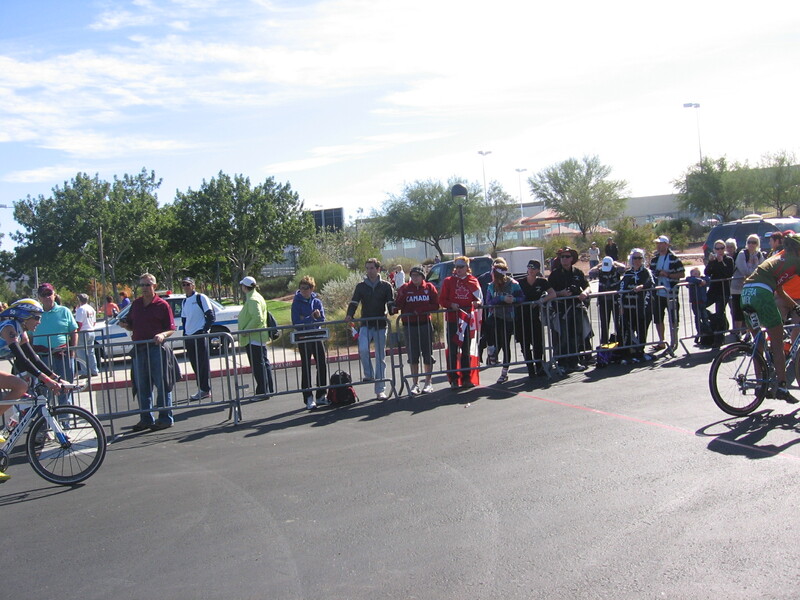 The bike course consisted of two out and back loops on either side of Lake Mead (created by the famous Hoover Dam), a National Recreation Area. The winds weren’t too bad, the weather was clear, the pavement was generally super smooth, the desert and lake views were pretty scenic, and it was fun going fast! It was also neat to see approximately where I was behind the front cyclists at each turn around. I was going back and forth with Amanda Lovato, an American for much of the bike, and we entered T2 together in Henderson. The bike consisted of non-stop climbing or descending, and by about the 100km mark my legs were feeling pretty punched on some steep bike path climbs. I was feeling ready to be done riding – I was also thinking about the fact that if I was doing an Ironman, I’d still have 60km to go – yikes! 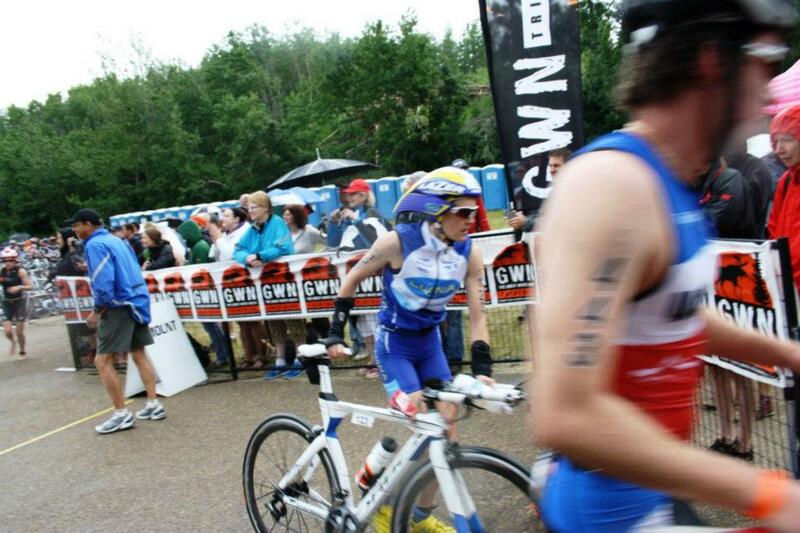 Mom, the photographer catches my front end coming into T2, ha! 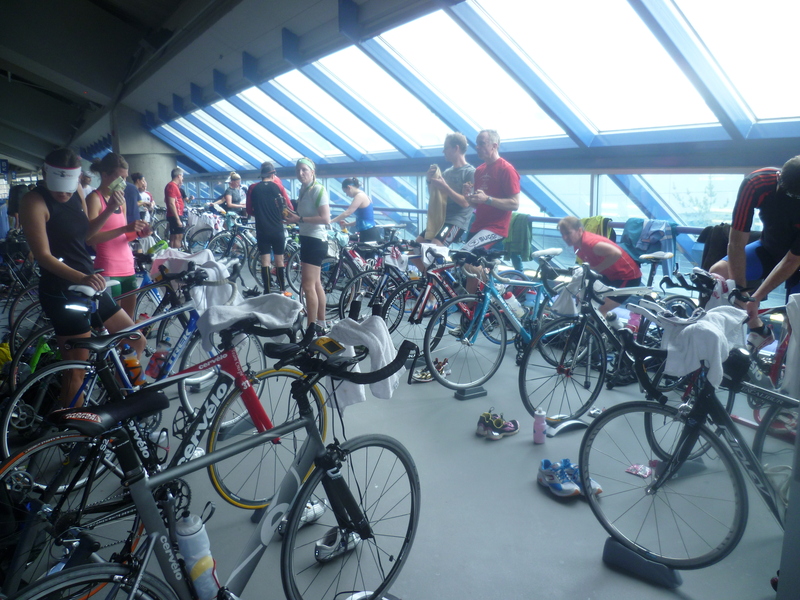 Entering T2 was awesome because we just dismounted and volunteers took our bikes. They also helped us grab our run gear back and get changed in the changing tent. 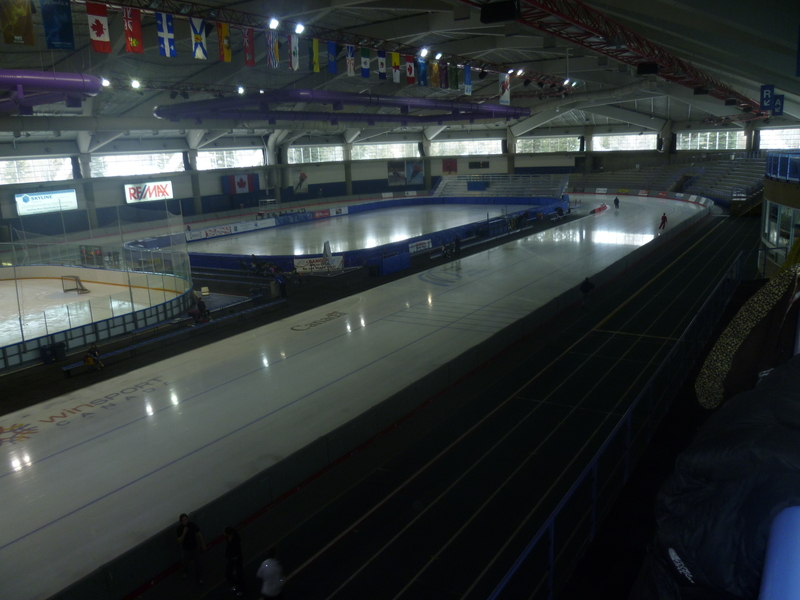 Then it was off to do four laps of 7.5km run course. I started the run in about 13th position. I felt great from the start and got into a pretty good rythmn, and tried to find a pace that felt fast but not too hard in order to pace myself. Not unlike the bike, the run had a few short sections that you might call “flat” but otherwise, it was a loop that was all uphill and then all the way back down. By the halfway mark in the run I’d moved into 10th position but by mile 13-14ish I started to wonder if I could get through it! I was well-hydrated so was mainly taking coke and gatorade from all the aid stations. With a few miles to go though I was actually feeling hungry and instinctively grabbed a cookie from a tray at the aid station dangling in front of me, maybe a bit of a risky move to eat while running! Although I found a second wind in the last few miles, a Polish girl recaught me, and I crossed the line in 11th, after getting through the 30km run in 2h15 minutes, and my total time for the day being 6h09! Rachel Joyce and Leanda Cave of Great Britain came 1st and 2nd, and Meredith Kessler from the USA was third to complete the podium. As far as the other Canadian women in the Elite race, Tenille Hoogland had a great day, finishing 7th, and Margaret Bailey was 15th. As a result, we came second as a nation, (a team category I didn’t know about until they announced it at the post-race dinner) behind the U.S. 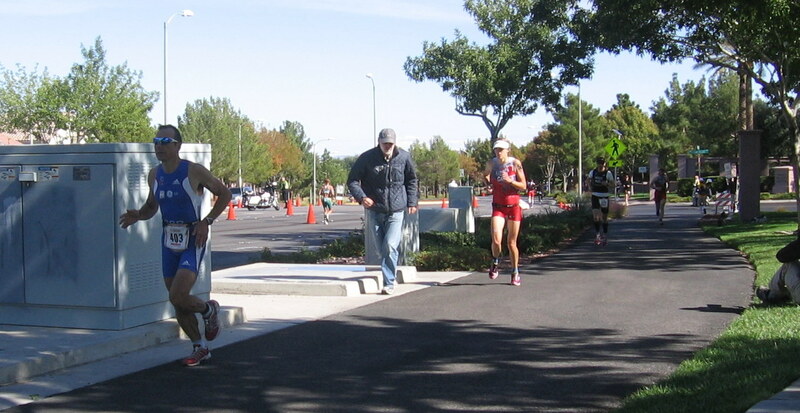 Although I was a little nervous about following all the ITU rules I had learned about at the elite race meeting, on race day the organization was super impressive. It was fun to represent Canada for the first time in a race as well. I was told there were about 150 Canadians and I could see them everywhere on the course and there were tons of spectators cheering for Canada too – maybe our red and white race kits stood out more as well! Thanks to everyone who has supported me for a very fun, and productive 2011 season of racing. I especially could not do it without the support of the LUNA Pro Team, my husband, my parents, and my Coach, Cal!! 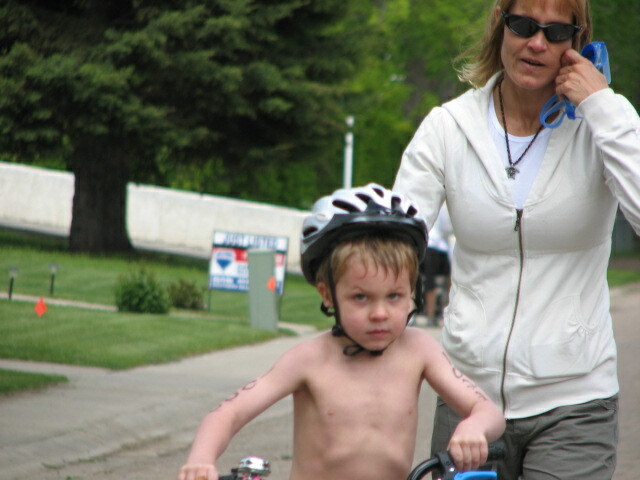 Although it is super nice to have a major race at home the logistics of the Calgary 70.3 are a bit crazy. Since it is a point to point race, all bikes are required to be racked at T1 the day before out at Ghost Lake, which is a good half hour west of the city. Race morning began with a 3:00am wakeup, a short taxi ride to the host hotel downtown where I got body marked before hopping on the 4:00am shuttle bus for a 45 minute ride out to the start. It was finally getting reasonably light about 25 minutes before our Pro wave start at 6:10. When I first arrived I was amused to see several Pros in transition wearing head lamps, these guys know what they’re doing!! 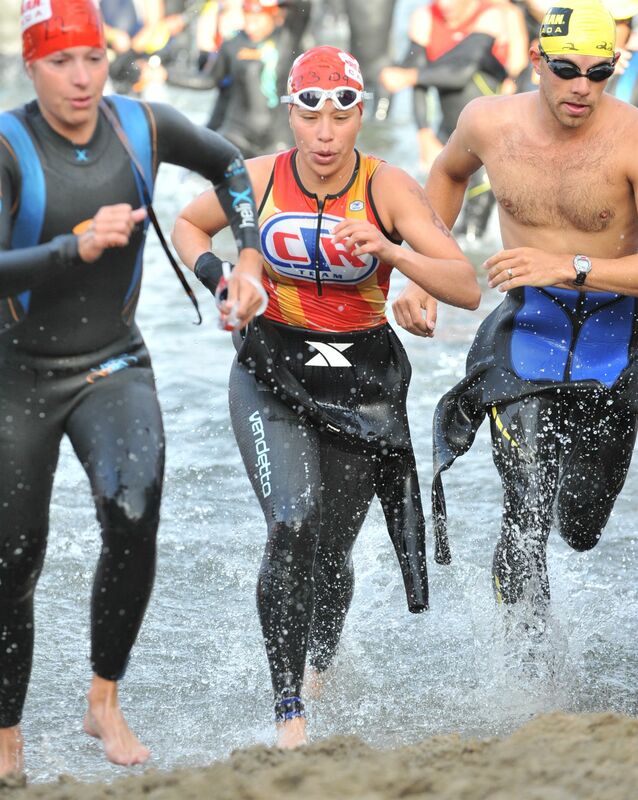 The water was brrrr, cold, but I decided I would do a short warm-up to avoid absolute shock when the gun went off. As we started I went after feet in front of me but was promptly dropped into no mans land with a few trailing behind me. It was tougher having to sight the whole way and even tougher once I could barely feel my hands and feet anymore and my coordination went out the window, even my face never really warmed up which was weird and rare for any open water swimming I’ve done. Thirty-two minutes later I was out of the water in fourth place, and very grateful to the volunteer wetsuit strippers out there today otherwise there was no way I would have got my wetsuit undone with how numb I was! Although the weather eventually heated up nice and hot by the end of the run, going out for a fast ride on a time trial bike in a tri suit with no socks or gloves on isn’t exactly toasty at before 7:00am in this climate. For the first 30-40km of the bike I was seeing cross-eyed and riding rather wobbly before I eventually warmed up enough for my hands to get their circulation back and properly grab my gels and water bottles! So that’s when the race started to get a little more fun. The course is a bit long at 94km and other than a few signifiicant sustained uphills it is fast, rolling smooth and fun most of the way to T2 at the Glenmore reservoir, southwest of downtown Calgary. I really had no idea how I was doing until I passed my coach at the second aid station who told me I was 2:30 back of third place, and I thought, hey cool! I continued as strong as I could into T2, and headed out onto the run in 5th position after 2:32:55 on the bike, the third fastest split. I moved into 4th after the first few km, and worked on keeping a steady even rythmn on the out and back run course along the paved bike path, thankfully a good amount was in the shade too. I have bad memories of the same race two years ago when I ended up in the med tent for an hour afterwards with super low blood pressure and a high heart rate. But by 8km in I realized I was feeling pretty good, and pushed on to end with the fastest run split of the day for 1:28:06 and just 24 seconds short of catching third. Well, it wasn’t faster overall from my attempt at almost the same course two years ago, but I at least feel fitter to go the distance now, and that is a big thanks to Coach Cal who helps me maximize the quality out of the training hours I have to work with. I also have to give a HUGE thanks to my friend Luke Way for helping me get through this race feeling much better on my Orbea Ordu time trial bike. After Wildflower in April I was so sore, I could barely straighten my left leg, let alone walk the next day! So recently Luke, a professional SICI bike fitter, helped me out. After some measurements, flexibility testing, body marking, filming, dartfishing, spinning, and lazering, Luke repositioned my cleats, adjusted my saddle position, flipped my stem, and moved back my bars a little. Secondly, he is also a master mechanic and when I realized my derailleur was majorly messed up when I dropped it at T1 yesterday, he went out there in the evening, busted through the security, put in a new cable, and adjusted my derailleur so that it was shifting beautifully again for today! Merci Luke!! !